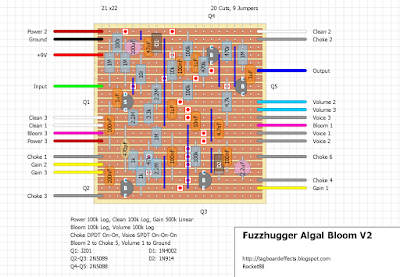 The Algal Bloom is a harmonically rich, wide-range fuzz! From mellow to gritty overdrivey tones, to beautifully thick fuzz, to crunch, crust, and throaty fuzz roars! V2 adds an all-new Choke toggle that turns the Algal Bloom into a Harmful Algal Bloom, a raunchier mode that goes from dying to crusty, to crunchy, to whiplash! 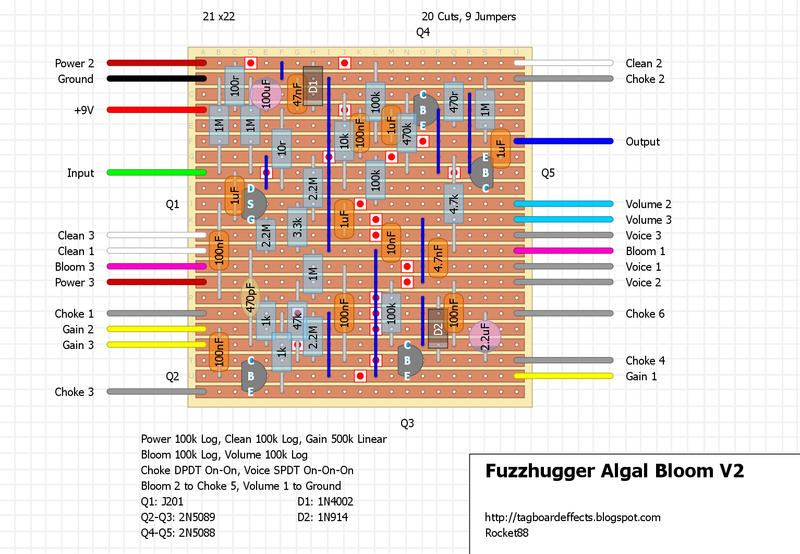 A new 3-way filter toggle lets you smooth clipping and highs for ultimate control.The Algal Bloom is known for its open tone and many chord-friendly settings, with fantastic definition and note-separation, even on high gain settings. The controls are uniquely interactive for incredible range. The pedal has a unique sound and circuit, but also expands on some classic tones that fuzz enthusiasts will love. A workhorse of a classicish, garagey, all-around capital F Fuzz. • Gain: Gain adjustment and clean-up! As you back it off, it cleans up your fuzz, also adding a hint of sputter and fizzle. Hard right is full-on! • Bloom (Fuzz): Expands and pushes your fuzz tone, adding gain, sustain, and definition. Hard right is maxed out...a unique, throaty, brash-yet-full tone! 12 o'clock is its "home setting," for thick fuzz tone! .• Level: Your master volume control. 2) Up: slightly smoothed highs, reducing clipping and fizz activity from the highs. Took a crack at building this tonight. I've got no signal at the base of Q4, however I have signal at Volume 2 and Clean 2, which makes no sense to me. I'll double check it with a fresh pair of eyes tomorrow. i think i spotted the error. one of the cuts was misplaced. there should be a cut at column j row k, and there shouldn't be a cut at column i row i. so you can make the corrections by making the new cut and put a jumper (small piece of wire) on the copper side to essentially remove the wrong cut. A couple more discrepancies I found compared to the schematic I mentioned above. The 470pf two ground should be on the other side of the 1k resistor, and the 100n capacitor connected to the voice 3 should be 10n. I won't be home to make these changes until later tonight, but I'll report in when I do. thanks for spotting those. i originally only looked for issues around Q4. i went back over the whole layout and schematic and found a few other issues. i corrected the layout accordingly. Very clear sounding fuzz, even with the bloom turned up. It gets pretty nutty with the choke and the the power knob. I like it a lot. Thanks for the layout! Should the SPDT be ON-OFF-ON? Never seen ON-ON-ON. No. On-On-On. Those are more common in guitar wirings. Although, i do recall Suhr Riot calling for one of these too. So for that switch from ebay, would you just use half of the leads, since the layout calls for a spdt, and that switch is a dpdt? which switch are you talking about because both are used for this pedal. the choke switch IS a DPDT On-On switch, and the Voice switch IS a SPDT On-On-On switch. The voice switch. The link on ebay features a on-on-on DPDT switch. It shouldn't matter though, right? I figured that even though its double poled, you'd only have to use half of the leads, since the layout calls for a SPDT on-on-on, and not a DPDT. Just get the right switch and save yourself headaches and spending extra money. You can get them from tayda cheap. Okay :) I found this link from Tayda. Again, if it isn't too much trouble, how would you go about wiring up this switch? There are six leads for the switch, and three needed for the layout. So what exactly is the "clean" pot for? I didn't see it on the pedal itself, and it's not a trimmer, so I was just curious. Can it just be set and kept inside the enclosure, or is it usable as a regular pot and work affixed to the enclosure with the others. It allows you to add your clean signal into the fuzz. It's part of the V2, I didn't add it to the circuit. Okay, I'm sorry I've been asking so many questions, but this is the very last, how exactly do you wire the dpdt switch in terms of leads? is it intended to be read like this? K. Got it built, having some technical difficulties now. I may or may not have (it was late last night and I can't remember for sure) tested it using the wrong polarity, because I test wired it backwards. Today, we tested it and we get some signal, but not until stuff is turned considerably up. The only knobs that appear to be doing anything are clean, gain, and maybe a little bloom. Don't know if I accidentally broke one or multiple caps, or ruined transistors, so for troubleshooting, does anyone have any idea where to start? Actually minus that, all of the pots do something. I replaced that cap, haven't tried the diode yet. I think I've replaced all of the transistors but it still isn't 100% yet. What would it sound like if said diode was broken? I really don't know but if your build is putting out sound I'd guess it isn't the problem. Yes, black lead to ground and the red lead to the transistor (or other component) lead. Obviously this needs to be done with power on - and a check of the supply voltage (especially if from a battery) can be handy too. I know this from several queries Ive had over a couple of pedal builds. I'm only up to build number 11 or so, so still quite the newbie. My clean knob doesn't do anything. As far as I can troubleshoot it's wired as per the diagram? Also aren't clean blends usually linear pots? The symbols for the 2N transistors are backwards. So I had all mine backwards.